Flourless Chocolate Cake is an insanely rich chocolate dessert recipe. Similar to the inside of a truffle, this gluten free dessert will satisfy cravings! This chocolate dessert is so rich, just a small sliver will be enough. If a rich, decadent dessert is what you’re looking for, look no further. 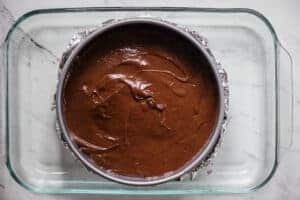 Much like my delectable creme brulee recipe, flourless chocolate cake might seem a bit intimidating to make at first, but it’s really quite easy. Plus, you can’t ask for a more decadent, rich, and drool worthy recipe that is sure to impress anyone! What is flourless chocolate cake made of? 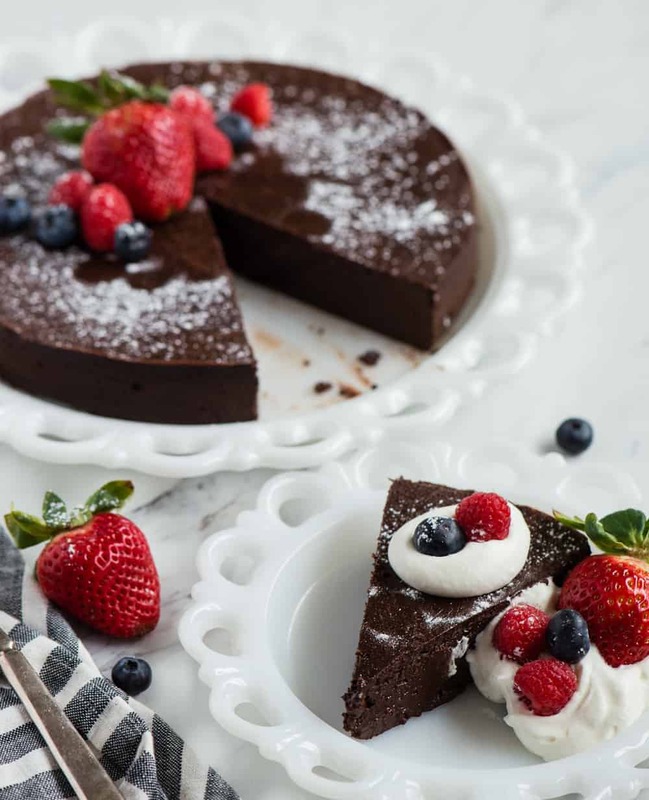 There are lots of different recipes out there for flourless chocolate cake, but the main ingredients in this recipe are sugar, chocolate, butter and eggs. The large quantity of eggs are what allow this dessert to take on the form of a cake without the addition of flour. 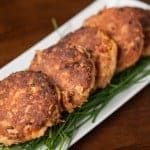 To make this recipe really stand out, I like to add a few other ingredients that are real game changers, in my opinion. Vanilla – Okay, nothing earth shattering there. I think pretty much ever dessert recipe deserves vanilla, but I also consider it a necessary ingredient in flourless chocolate cake. Grand Marnier – Everyone knows orange and chocolate are a magical duo, so adding orange flavored liqueur to a flourless chocolate cake seemed like a no brainer to me. You could take it a step further and add a bit of orange zest as well to really enhance that citrus essence. Strong coffee – This is also the secret ingredient to my heavenly homemade chocolate cupcake recipe. Even if you don’t like coffee, a hint of strong coffee with rich chocolate really enhances the flavor. What does flourless chocolate cake taste like? If you’re wondering if flourless chocolate cake tastes like the kind of cake you get at the bakery or make at home from a mix, it does not. If you’re wondering if flourless chocolate cake tastes like a gluten free cake, it does not. Even though this dessert recipe is called cake, it doesn’t taste much like any cake I’ve ever enjoyed. Cake is typically moist, spongy, and almost bread-like. Flourless chocolate cake tastes more like the center of a chocolate truffle. 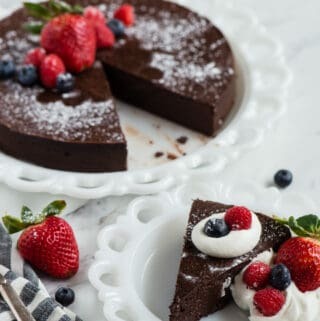 This chocolate dessert recipe is so rich and decadent, you will only be able to enjoy one small bite at a time. The shape and the flavor certainly remind me of a chocolate cake, but flourless chocolate cake deserves it’s own category. How do you know when flourless chocolate cake is done? Much like a cheesecake, you want your flourless chocolate cake to be set yet still a bit jiggly in the middle before you remove it from the oven. The water bath and low cooking temperature really make this recipe difficult to mess up, so don’t worry if you end up taking the cake out of the oven a few minutes early or late. The “done” window is probably around 10 minutes long, so just keep checking the center as the time approaches. Does flourless chocolate cake need to be refrigerated? Yes, flourless chocolate cake should be kept refrigerated, however I highly recommend letting it set out at room temperature for at least an hour before served. Trust me, this cake is plenty delicious cold, but the chocolate and butter gets hard when chilled. I much prefer the texture when the cake has been sitting out for a bit. 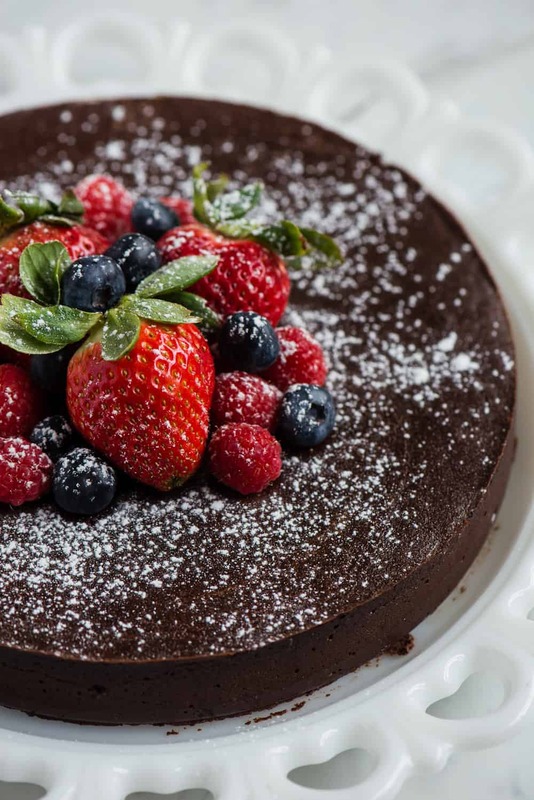 To store flourless chocolate cake, simply cover or place in air tight container in the fridge. There are two schools of thought here. Some people think flourless chocolate cake is best served with vanilla ice cream and others vote for whipped cream. I, myself, much prefer a homemade whipped cream when enjoying flourless chocolate cake. In my opinion, ice cream is too sweet to be paired with this dark chocolate sweet treat. Instead, a lightly sweetened whipped cream enhanced with a bit of pure vanilla extract and Grand Marnier is perfect. 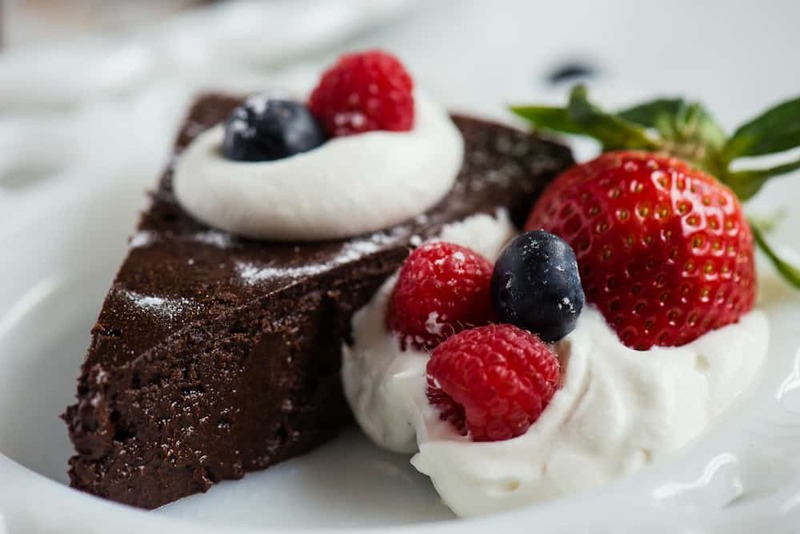 I think everyone would agree that fresh berries are also a divine choice to serve with flourless chocolate cake. 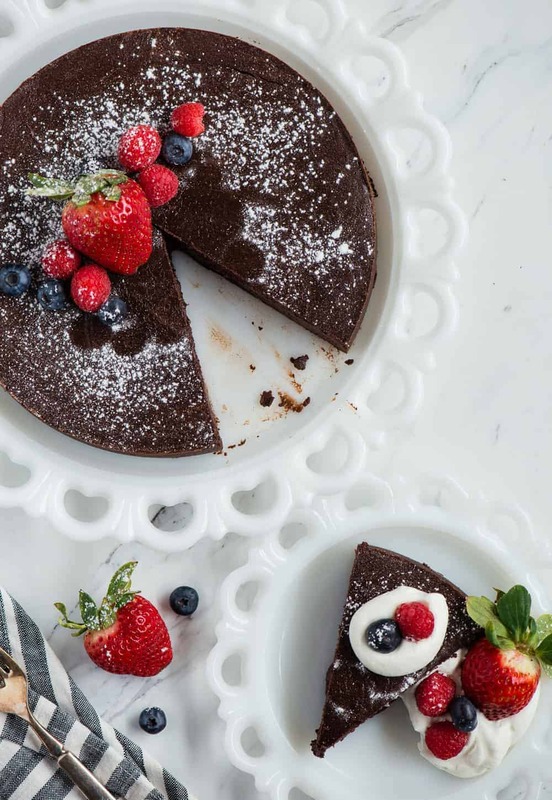 Flourless Chocolate Cake is an insanely rich chocolate dessert recipe. Similar to the inside of a truffle, this gluten free dessert will satisfy cravings! Preheat oven to 300 degrees F. Line the bottom of a 9-inch spring form pan with parchment paper. Spray the inside of the pan and top of the parchment paper with cooking spray. Wrap the bottom of the spring form pan with heavy duty aluminum foil. 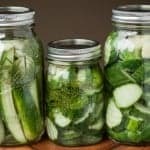 Separately, fill a large casserole dish (I used 11x13 inch) or baking sheet with about 1/2 inch of water to form a water bath. In a small saucepan over medium heat, combine sugar, coffee and salt. Stir well and heat just until the sugar and salt have fully dissolved. Remove from heat. 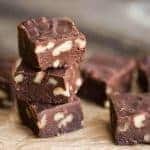 Place chocolate in microwave safe bowl. Heat in 1-minute increments on 50% power to melt, stirring well in between each minute. Alternatively, you can melt chocolate in a double boiler. As soon as all the chocolate has melted, transfer to the bowl of a stand mixer. Using the paddle attachment, beat on low to medium speed, adding one tablespoon of butter at a time until all of the butter has been added and it has melted into the chocolate. With the mixer running, add the coffee sugar mixture and blend until fully mixed. Add the vanilla and Grand Marnier; mix well to combine and scrape sides of bowl as needed. With the mixer still running, slowly add eggs. You want them fully incorporated, but you do not want to overly mix the batter. Scrape the sides of the bowl well and give a final stir to make sure everything is fully mixed. Transfer all of the batter to the prepared spring form pan. Place the aluminum foil lined pan in the water bath and bake in preheated oven for 45-50 minutes. The center of the cake should be set but slightly jiggly. For best results, chill cake in pan over night. I was able to skip this step and remove it from the pan a couple hours after I took it out of the oven, but it was even better after a night of refrigeration. To remove from pan, release spring to life side off and transfer to a cake platter. Serve with freshly whipped cream or a scoop of vanilla ice cream and fresh berries. 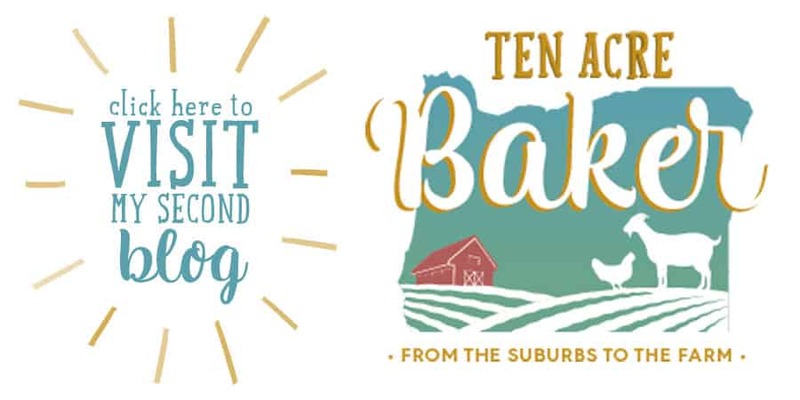 This post was originally created for The Recipe Critic where I’m a contributor and has been updated with more fun facts and tidbits for your reading pleasure. 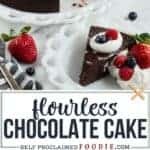 Yum, this chocolate cake sounds so light and fluffy and TASTY! Looks wonderful. This look so rich! Love the idea of adding strong coffee to enhance the flavor! That chocolate cake – wow! It looks incredibly delicious and decadent. I cannot wait to try it 🙂 Scrumptious! Wish I could grab that chocolate cake through the screen!! Looks so decadent! Your recipe is very similar to mine! When I make my flourless chocolate cake, I use Chambord instead of the Grand Marnier and also make a raspberry sauce. 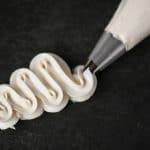 To serve, I place a couple of spoonsful of the sauce on a plate, place the cake on top, and garnish with homemade whipped cream, a fresh raspberry and a mint leaf.